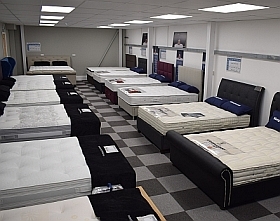 Depending on comfort or support the life of a mattress varies massively, it all depends on how well you take care of it, how you sleep on it and how often you rotate it. You'll know when it's time to get a new mattress when you start waking up in discomfort or pain. Some companies may push you into a purchase when you don't necessarily need to replace your mattress yet, so just because your mattress is 8 years old, doesn't mean you need a new one on that basis alone. A very common occurrence for us. People often think that an orthopedic firm mattress provides the best support for their bad back, most likely due to the medical term used in the name. Sleeping on a mattress that's too firm can create aches and pains on pressure points, leaving you to have a difficult nights sleep. You need to find a mattress that supports your shoulders, hips and feet, a memory foam or hybrid medium/firm mattress may do the trick. Back in the old days mattresses were a lot thinner, so using sprung divan bases helped provide further support and absorb some shock. Nowadays a suitable mattress should support your weight without the need for a sprung base, all you need is a solid platform underneath your mattress. Of course, if you do decide to go for a divan base with a sprung element, make sure you try the mattress you're looking to buy on a sprung base, too. As this can make the mattress feel slightly different at times. This may have been the case back when our mattresses were a lot thinner and had less fillings, but nowadays it really just depends on the type of mattress you have. Any mattress can handle a vacuum cleaner being run over its surface, this helps to remove loose dirt and dust, though a steam cleaner is probably the best way, providing you leave it enough time to dry (don't do it in the evening!). The best way to minimise the need to clean is by using a mattress protector, these absorb spillages and are far less expensive to replace compared to mattresses. This is a growing trend, especially with the 100 night trial mattresses gaining momentum in the recent years. A mattress for a heavy person would not offer the same support for a lighter person. If you and your partner are significantly different in size/weight/sleeping positions, and you can't find a mattress which suits the pair of you, why not go dual tension? It can take your body up to 1 month to adjust to a new sleeping surface. Your muscles and joints have a 'memory' as such, of how to find the comfortable spot on your mattress, so adding a new one into the mix can cause discomfort for a short while, known as the "adjustment period".